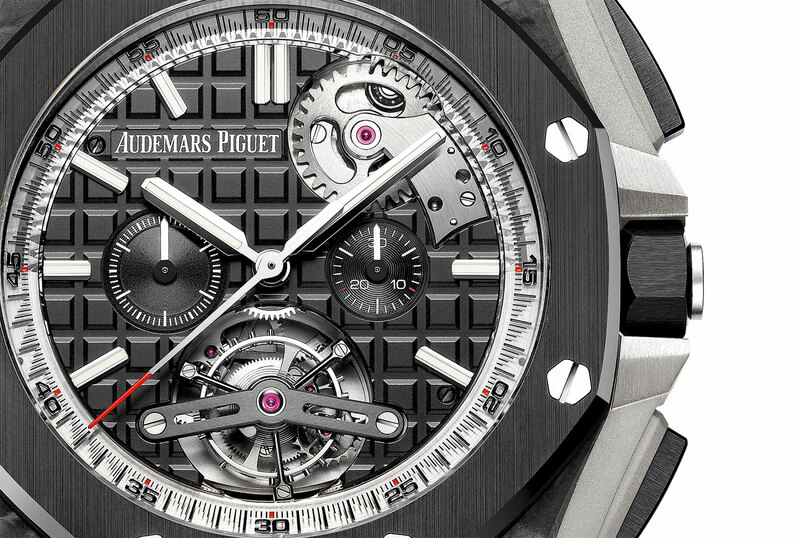 Audemars Piguet will soon unveil the Royal Oak Offshore Selfwinding Tourbillon Chronograph at Watches&Wonders 2014. This combines an unusual chronograph-tourbillon movement featuring peripheral made by Renaud & Papi with a carbon composite case. 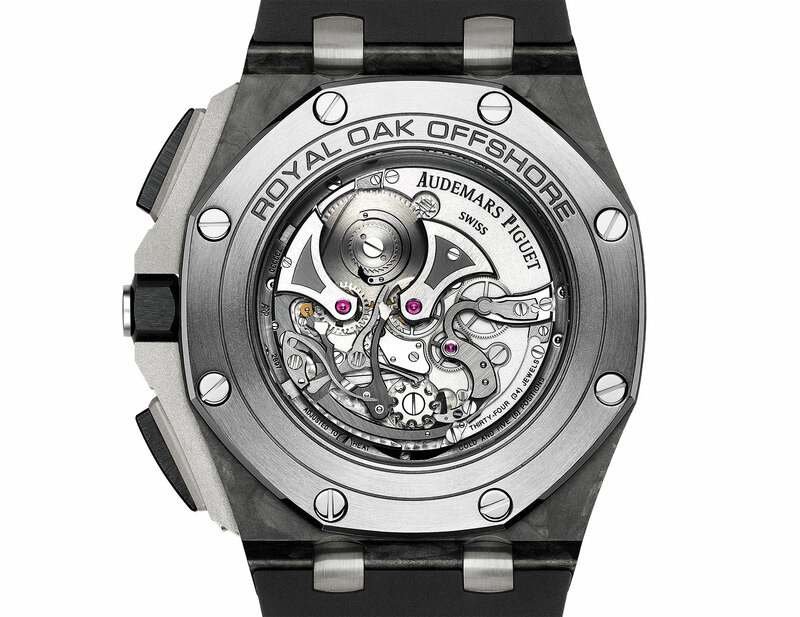 The most interesting aspect of the new Royal Oak Offshore Selfwinding Tourbillon Chronograph is the calibre 2897 inside. Though not new, having been used in similar models before, the movement is still unusual. 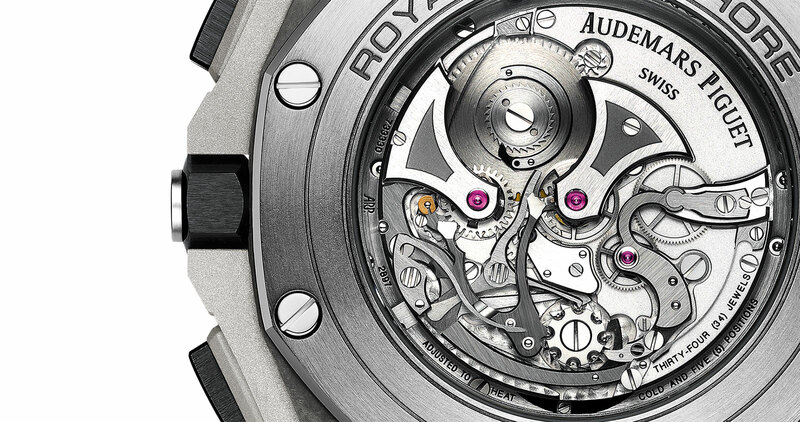 Beyond the fact that is is complicated – it combines with a chronograph and tourbillon – the 2897 movement is self-winding. But unlike conventional automatic movements which have full rotors that cover half the movement, this features a novel peripheral winding mechanism under the dial. The narrow, semicircular made of platinum sits under the dial, rendering it almost invisible, but not quite. That’s because the chapter ring of the dial with the minute markings is made of clear sapphire, revealing the peripheral rotor as well as the large toothed gear that connects to the winding mechanism at two o’clock. Seen from the back, however, the movement looks traditional, with hints of nineteenth century pocket watch movements in its design, as is often the case with Renaud & Papi’s chronograph movements. Aside from the elegantly shaped bridges, another notable detail is the grand sonnerie style winding click visible at 11 o’clock on the movement. The rest of the watch is vintage Offshore. The case is 44 mm, in carbon composite with a black ceramic bezel, ceramic pushers and titanium crown guards. The Royal Oak Offshore Selfwinding Tourbillon Chronograph is a limited edition of 50 watches, with the retail price yet to be announced. But expect it to be around US$280,000, given pricing of comparable models in the current collection. 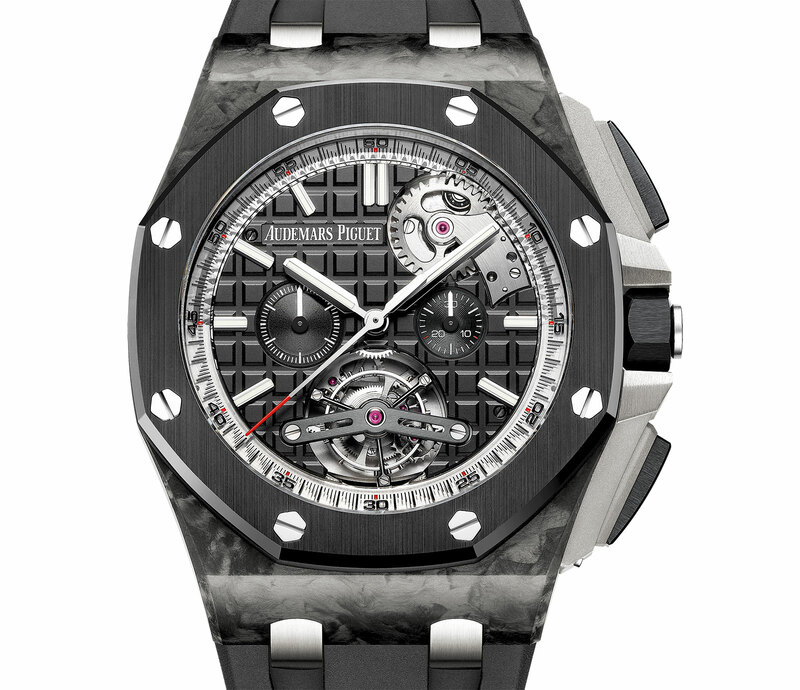 Featuring a tourbillon, chronograph and unusual peripheral winding rotor, the Audemars Piguet Royal Oak Offshore Tourbillon Chronograph Carbon combines the sporty Offshore and the ingenuity of movement specialist Renaud & Papi.